It’s hard to believe that the year is nearly halfway over. So far, 2017 has been a busy year for our department but with your dedication and hard work, we have been able to meet the many challenges that have come our way. Open the attached newsletter pdf to read more. Meteorologists say Hawaii could see more hurricanes this year if El Nino conditions continue to develop. 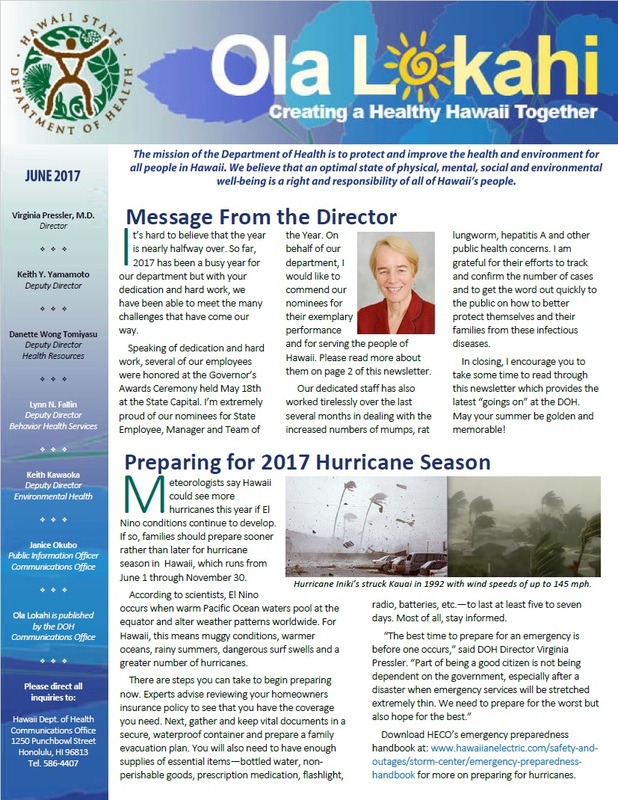 If so, families should prepare sooner rather than later for hurricane season in Hawaii, which runs from June 1 through November 30. Open the attached newsletter pdf to read more. Several DOH employees were honored for outstanding work performance at the 2017 Governor’s Awards Ceremony held May 18 at the State House of Representatives Chamber. Open the attached newsletter pdf to read more. Falling is painful enough for most people but for the elderly, a simple fall can lead to often debilitating and even life-threatening injuries. To reduce the number of fall-related injuries and fatalities among Hawaii’s seniors, the State Department of Health is launching its Senior Fall Prevention Awareness Campaign from June 16 through August 30. Open the attached newsletter pdf to read more the cases statewide. Every day in Hawaii, thousands of seniors, immigrants, veterans and families rely on the Hawaii Food Bank for Meals. They need for assistance is unrelenting. Last year, the Food Bank distributed over 12.8 million pounds of food to people in need. Open the attached newsletter pdf to read more the cases statewide.